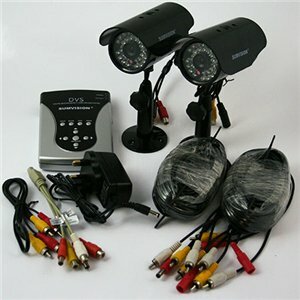 The Sumvision Tutis 2 Channel DVR CCTV Camera system is a great way to look after your prized property. Using 2 high qualitycameras using the latest compression methods, you're sure to capture what you need in outstanding clarity! The recording unit is extemely lightweight and comes with all the cables required making it very easy to fit and even easier to use! With a full colour and simultaneous audio recording, the camera system is intuative and easy to use making it perfect even if you dont know too much about technology! The Tutis two channel DVR is the ideal for household, small property surveillance.